What Are the Differences Between Helmets? MVP Track Time Only Allows SA2010 or Newer SA Rated Helmets! Motorcycle and Karting Helmets are NOT Permitted at an MVP Track Time track day. What Are the Differences Between the SA, M and K Standards? 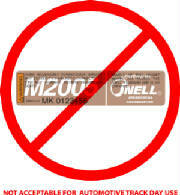 The SA standard requires flammability test while the M and K standards do not. The SA and K standards allow for a narrower visual field than M standard (Some SA and K certified helmets may not be street legal). The SA and K standards include a rollbar multi impact test while M standard does not. There shall be three impacts at each site tested against the roll bar anvil. Sites selected for roll bar anvil impacts must lie behind the fore plane and above the test line of the helmet. For the first impact the impact energy shall be 150 J for all standard level testing and 140 J for all deviation level testing. For the second impact, the impact energy shall be 120 J for all standard level testing and 115 J for all deviation level testing. For the third impact, the impact energy shall be 100 J for all standard level testing and 95 J for all deviation level testing. Given an ideal frictionless mechanical test facility, the standard impact energies represent 3.0+, 2.4+ and 2.0+ meter drops of a 5 kg headform and supporting assembly. The 5-year replacement recommendation is based on a consensus by both the helmet manufacturers and the Snell Foundation. Glues, resins and other materials used in helmet production over time can affect liner materials. Hair oils, body fluids and cosmetics, as well as normal "wear and tear" all contribute to helmet degradation. Petroleum based products present in cleaners, paints, fuels and other commonly encountered materials may also degrade materials used in many helmets possibly degrading performance. Additionally, experience indicates there will be a noticeable improvement in the protective characteristic of helmets over a 5-year period due to advances in materials, designs, production methods and the standards. Thus, the recommendation for 5-year helmet replacement is a judgment call stemming from a prudent safety philosophy.